This study looked at how physical activity (PA) effects depression and satisfaction with life (SWL) in people with spinal cord injury (SCI) using both subjective and objective measures. This could lead to better options for people with SCI to improve their quality of life (QOL). The study found that spending more hours per day outside of the home and performing fewer car transfers were indicators of higher levels of WCP activity. Researchers’ hypothesis that there would be agreement between objective and subjective PA was supported. The study found that people who pushed further in their wheelchair reported fewer depressive symptoms. Satisfaction with life was related to time spent in leisure physical activity, but not to distance of wheelchair propulsion. The study results suggest that spending more time doing meaningful and fun activities, not just physical activity, leads to a greater satisfaction with life. 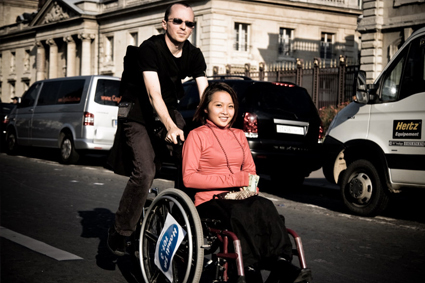 The researchers recommend that encouraging people with SCI to use their manual wheelchair as often as possible, as an alternative to planned exercise, may help reduce depression. There were 86 adults (at least 18 years old) with spinal cord injury enrolled in the study. Seventy-seven were male and 9 were female, with a mean age of 37.4 years and an average of 11.1 years since SCI. All subjects were at least two years post SCI, had no shoulder pain ( 12 on the Wheelchair User’s Shoulder Pain Index), used a manual wheelchair (50% of locomotion), and weighed less than 250 lbs. Physical activity was measured through 24-hour recall and three-day recall questionnaires. Researchers contacted study participants every one to two months to collect the odometer information and transfer frequency in the past 24-hours for a three-year period. Frequencies were averaged for the number of car transfers reported from the 24-hour recall, as were the average daily values for distance and speed from the odometer readings reported. Study authors also asked participants about their activities in the past three days, including how much time was spent inside, at home, and doing fun activities (like reading). Leisure time was calculated from these reports by summing the hours spent performing leisure activities. To measure depression, participants completed the Patient Health Questionnaire (PHQ-2). Participants also completed the Satisfaction With Life Scale (SWLS) to measure well-being, an element of QOL. Mulroy, S.J., Hatchett, P.E., Eberly, V.J., Haubert, L.L., Conners, S., Gronley, J…Requejo, P.S. (2016). Objective and self-reported physical activity measures and their association with depression and satisfaction with life in persons with spinal cord injury. Archives of Physical Medicine and Rehabilitation. *The contents of this summary have been reviewed by the corresponding author of the original study. The contents of this quick review were developed under a grant from the National Institute on Disability, Independent Living, and Rehabilitation Research (NIDILRR grant number 90DP0012-01-00). However, these contents do not necessarily represent the policy of Department of Health and Human Services, and you should not assume endorsement by the Federal Government.